My husband's birthday was last week, so I was asking him what kind of cake or cheesecake he wanted. Last year I made him a chocolate tres leches cake I had found on Pinterest, so I asked if he would like that again. He replied that he wanted a German chocolate tres leches. I had never heard of such a thing, and Googling for recipes did not yield any results--except for one using a boxed mix and dumping some milk on it, which was like a cheater version in my opinion. "Make one up," said my husband. I swear, ever since I created a recipe for Beer Cheesecake--also a whim of his--the man thinks I can do anything in the kitchen. So I decided to give it a try, and I'm so glad I did. Folks, this is the best cake I have ever tasted in my life, and that's not an exaggeration. My friends and family who were lucky enough to get a piece of this cake will completely back me up on this one. I have had people who never even tasted it begging me for the recipe after just seeing the pictures. I had originally planned to post the recipe in a few weeks, but decided my other posts can wait as I bumped this one up to top priority; I was a little afraid people were going to start banging on my windows at night, trying to get the recipe out of me sooner. This cake is 100% from scratch, from the cake itself to the whipped cream and the delicious frosting. It's a bit of a time commitment--definitely a special occasion cake--but worth every second it takes to make. The post is long, too, so just settle back with a cup of coffee and get ready to drool over these pictures. Seriously, my photography is only so-so, but the cake still looks so good you'll want to dive in and grab a bite...or two. I started with a fabulous recipe for German Chocolate Cake from Southern Living, which I'm sure is incredible by itself, without being turned into a tres leches. Then I added homemade Coconut-Pecan Frosting, also from Southern Living. To this beautiful concoction I added the traditional three milks mixture; if I had stopped here, this still would have been great, but I really wanted to make a complete mixture of German chocolate and the traditional tres leches. In other words, I wanted this to be more than just German chocolate with some added moisture. So I frosted the entire cake with homemade whipped cream, adding one more element of traditional tres leches. The result was this amazing blend of these two scrumptious cakes into one decadent dessert. Okay, I've jabbered enough about how good this cake is; let's get to the recipe! Whew, isn't that the longest ingredient list ever? Don't despair, I'll walk you through every step and I promise the end result is worth it! All right, let's start with the cake! Preheat the oven to 350°. Lightly grease the bottoms of 2 9-inch round cake pans. Cut a piece of parchment paper the size of the bottom of the pan, and lay it in the pan. Lightly grease and flour the paper and sides of the pans. Break the chocolate bars into smaller pieces and place them in a microwave-safe bowl along with the 1/2 C of water. Microwave the chocolate and water on high for 30 seconds, stir, and then microwave for another 30 seconds or until the chocolate is melted and smooth. This smells so heavenly as it melts! Beat the butter and sugar with an electric mixer at medium speed until fluffy. Add the egg yolks, one at a time, beating just until blended after each addition. Stir in the chocolate mixture and the vanilla. Add half of the flour mixture, then all of the buttermilk, and then the remaining flour mixture, beating at low speed just until blended after each addition. This was the point I started falling seriously in love with this cake. I mean, just the batter is absolutely gorgeous! So gorgeous, in fact, that I felt it warranted a close-up picture. Put the egg whites in the mixing bowl. Beat the egg whites at high speed until stiff peaks form. Sorry for the awkward shadow across this picture, but it gives a good example of what consistency you're looking for. It's amazing to me how a few egg whites can become so fluffy! Transfer the egg whites to the bowl with the batter. Bake at 350° for 30 to 40 minutes or until a knife or toothpick inserted in the center comes out clean. Note: This baking time may be off; you may need to bake it more like 45-50 minutes. The recipe originally called for baking this in three pans and baking them for about 25 minutes. Since I put it in two pans, the cakes are thicker and take longer to bake. I honestly don't remember exactly how long I baked them, because I just kept adding a few minutes at a time, so I went with a conservative estimate. Don't think you're doing something wrong if you have to bake them longer than what I said! When they are done, pull them out of the oven and let them cool on a wire rack. It's so hard not to just dig in at this point! Normally you would be about done with the cake at this point, but there's still a lot left to do. However, you now get a break for a little bit. The cakes need to completely cool before the next step. When the cakes are completely cool, poke multiple holes in them with a fork. Be super generous with the holes, and make sure to put them all over--on the edges, in the middle, everywhere. The more holes you have, the better the milk mixture will soak into the cake. It's a little heartbreaking to destroy the perfect cake, but it will be worth it! Combine the three milks: the cream, sweetened condensed milk, and evaporated milk. Melt the 1 oz of German chocolate by microwaving it in 15-second intervals and stirring after each one. Whisk the chocolate into the milk mixture. Because the milk will cool the chocolate, you will probably end up with small clumps of chocolate instead of a completely smooth mixture; it's perfectly fine and won't affect the finished cake. Carefully pour the mixture over the cakes, being sure to cover the edges as well as the middle. Use up all of the milk mixture. It will pool up on top of the cake, but it will soak in over time. Now it's time to play the waiting game some more. Slide the cakes into the refrigerator for several hours or, preferably, overnight...but not before you do a little happy dance when you take another look at the amazingness you're creating. Several hours later, or the next day, you'll want to prepare the Coconut Pecan Frosting. Preheat the oven to 350°. Spread the chopped pecans in a single layer in a shallow pan, and bake until toasted and fragrant (about 8 to 10 minutes), stirring halfway through. Cool completely. Meanwhile, combine the evaporated milk, sugar, butter, and egg yolks in a heavy saucepan. Cook over medium heat, stirring constantly, until the butter melts and the sugar dissolves. I find it speeds things up to chop the butter into smaller pieces. Remove the pan from heat; stir in the coconut, vanilla, and pecans. Let stand, stirring occasionally, for about 45 minutes, or until it has cooled and reached a spreadable consistency. This frosting is so tasty I could eat it by itself, or as a topping on vanilla ice cream. Just look at that goodness! When the frosting has cooled, you can assemble your cake. Remove the cake from the refrigerator. See how the milk has all soaked in? Run a butter knife along the edge to loosen the cake from the pan. Overturn the cake onto your serving platter or cake stand; the cake should come out of the pan pretty easily. Don't forget to remove the parchment paper! Spread half of the frosting on top of this layer. Invert the second layer on top of this one and remove the parchment paper. I got giddy with excitement at this point, because I just could not get over how pretty this cake was, even before it was frosted. Place the cake in the refrigerator while you prepare the whipped cream. To make the whipped cream, make sure your cream is cold, cold, cold. The colder it is, the easier it will whip, so don't leave the cream out on the counter while you assemble the cake or gather ingredients. I've even heard that you should chill the mixing bowl. I didn't do that, and my cream turned out fine, but I was also using my KitchenAid at the highest speed setting (with the splatter shield in place, because that stuff was flying everywhere!) If you're whisking the cream by hand, you probably want a chilled bowl. Anyway, dump the cream and sugar into the mixing bowl. Whisk or whip the cream at a high speed. After a few minutes, it will become thick and spreadable. Use the whipped cream to frost the cake. I find it helpful to put a huge dollop of whipped cream on top of the cake, and then smooth it out, letting it fall over the sides. However you prefer to do it, just get the cream all over the top and sides of the cake, and then smooth it out the best you can with a butter knife or offset spatula. This prettiness is like a blank canvas just waiting to be decorated. Use a damp paper towel to wipe off any excess whipped cream that may have most definitely did fall on your platter. Carefully spread the remaining half of the coconut pecan frosting over the whipped cream, only on the top part of the cake. I saved out about a tablespoon of the frosting (really just the scrapings from the pan) to cover any blemishes, because it's really easy to accidentally stir up a little of the whipped cream into the frosting. When I was finished I just dabbed a little extra frosting on top of any of those places, and you couldn't even tell. If desired, garnish around the bottom of the cake with pecan halves. You are finally finished! This is so pretty and scrumptious, it looks like it could have come from a bakery! Stand back and admire your hard work. Take a few pictures to show off to family and friends, and then cut yourself a slice immediately, because you know you can't wait one more second to try this cake! Look at how you can see the milk mixture throughout the cake! Savor the decadent flavors of this awesome cake! Be warned, however, that everyone will expect you to share, and will also expect you to make this cake for every event in the future. 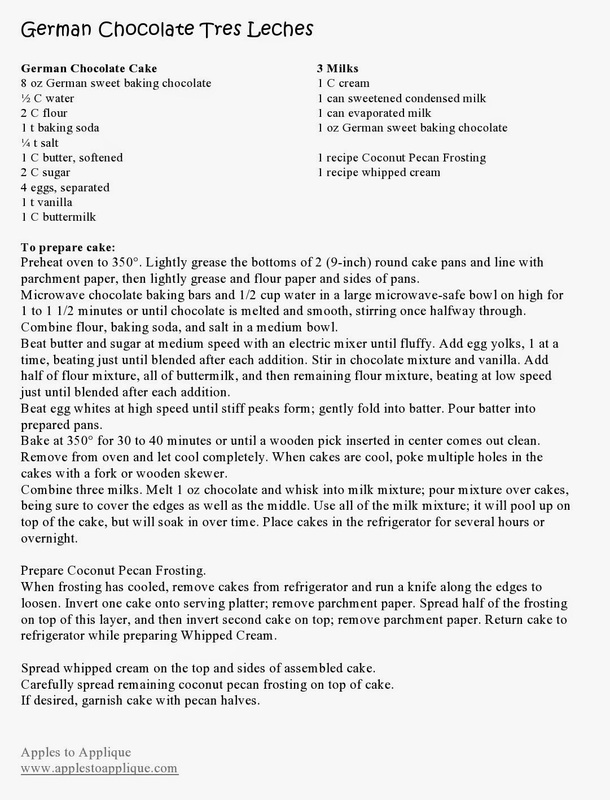 Right-click the images below to download a printable version of the recipe. I hope you love this recipe as much as my friends and family do. If you make this cake for a special event I'd love to hear about it! Leave me a comment; they always make my day! Linking up with Treasure Box Tuesday, Full Plate Thursday, Foodie Friday, the Weekend Retreat, and Inspiration Spotlight. This really does look delicious and I'm totally impressed that you created it on your own! I'm sure you're husband was too! Nice work! I think my stomach just expanded. Yum! Haha, right? Just the pictures will do that! I absolutely despise you. ;) I was doing so well on my diet and now this. I mean how you can go wrong with this cake...oh my gosh. I'm desperately thinking of how I can convince my husband (and calorie counting guard) that I need this cake. As a fanatic of restaurants like "House of Pie" I can say this is one of the best cakes I have ever had. 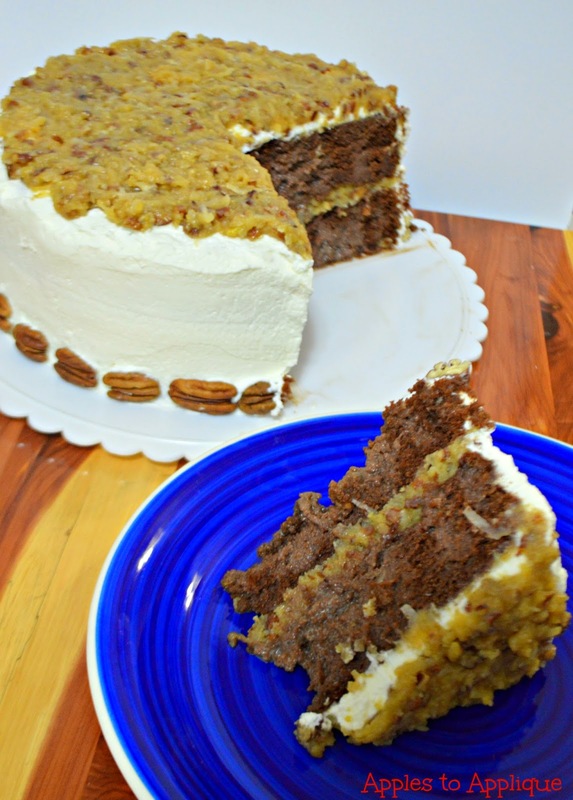 German Chocolate is my favorite kind of cake and the Tres Leche adds a moist and creamy element to it! You have to try this recipe! I'm so glad you enjoyed it! I agree it is one of the best cakes ever, but I may be a little biased. 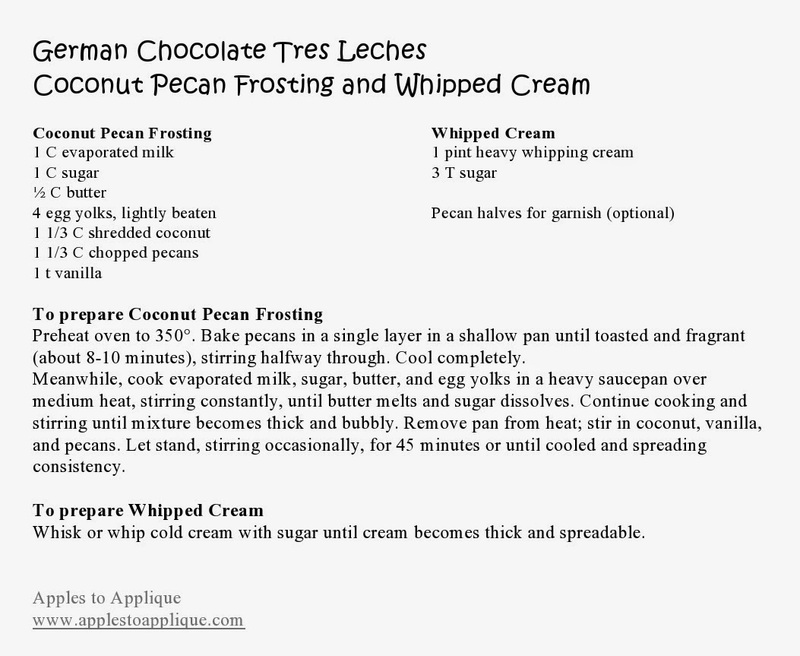 ;) I also enjoy the moist and creamy element added to the German Chocolate. That's the goal with the step-by-step--to encourage novice bakers to give it a try. :) Thanks for pinning and following! This cake looks amazing! And your step by step is awesome!! This looks delicious - you did a great job!! YUM! Ooooohhhh my goodness! This looks and sounds amazing! 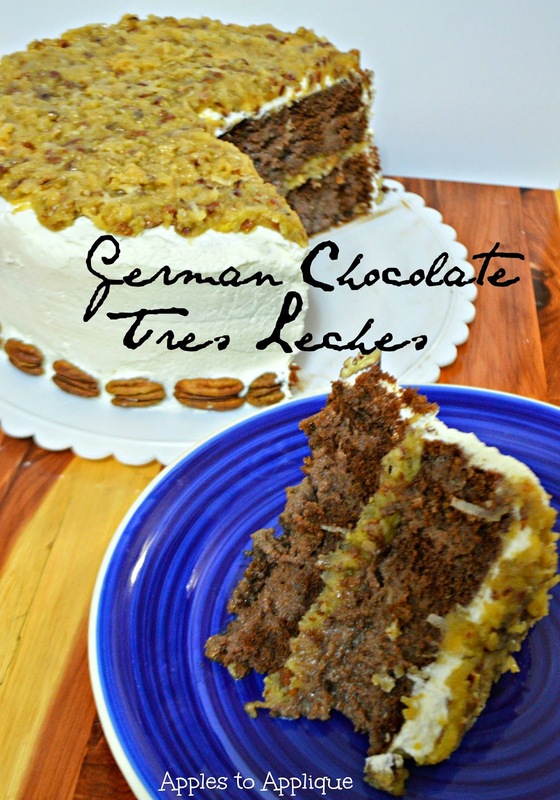 Tres leches is my favorite cake, and my husband's favorite is German chocolate, so this sounds like the perfect cake for us! I definitely will be making this for his birthday this year! Sounds like a match made in heaven! Let me know how you like it after you make it! I'm so making this this weekend! It looks so good!! It's so yummy! Please let me know how you like it! Thanks, Theresa! I hope you enjoy it, and I appreciate the pin!